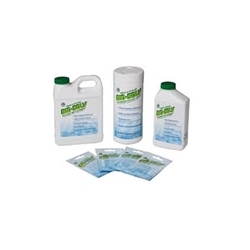 Bio-Solv is a tried and proven green solvent replacement which will out-perform traditional solvents such as Acetone, Xylene, MEK and other solvent based cleaning products. It is ideally suited for a variety of industrial cleaning and surface preparation applications including metal surfaces, paint systems, pumps, overspray, adhesive clean-up, parts cleaning, vinyl graphics and graffiti removal. Bio-Solv can be easily recycled though simple filtering or distillation for repeated reuse, and the low evaporation rate and high solvency formula can significantly reduce overall solvent usage. It contains no water and is completely reactive, unlike other green solvents which may contain up to 50% water.